A vision during an LSD trip is what inspired Owsley “Bear” Stanley, the Grateful Dead’s sound engineer’s mammoth feat of technical engineering, “The Wall of Sound”, irreversibly changing live sound and engineering for the better. It was a time when live sound problems plagued engineers, bands, and audiences equally. While rock concerts grew in size and scope throughout the 60s, audiences grew larger and louder, without the technical sophistication of amplification ever changing to meet this scenario. Screaming fans meant that low-wattage guitar amps could hardly be heard and without the help of monitoring systems, bands could barely hear themselves play. Things were so bad that the Beatles quit touring in 1966 because they couldn’t hear themselves over the audience. It was after this era that the band, the Grateful Dead, became obsessed with their sound, largely thanks to their eccentric and dedicated sound engineer. Though incredibly frustrated with the noisy, feedback-laden, underpowered situation, they did not want to give up playing live, and the Dead had Owsley on board to help solve the sound situation. The famous story goes that in 1974 the Grateful Dead drummer Mickey Hart walked on stage to find Owsley “Bear Stanley standing in front of a wall of over 600 speakers with tears streaming down his face. Whispering to the huge mass of equipment, Bear said, “I love you and you love me- how could you fail me?” This story sums up Owsley’s obsession with sound, both as a concept and as a physical thing. A former ballet dancer and craftsman from Kentucky, Owsley was also jailed twice for manufacturing and distributing LSD, the profits of which he used to finance the Grateful Dead for some time. The band which formed in the San Fransico bay area during the hippie days of the mid-1960s boasted of a huge cult following. An engineering dropout, he met the Grateful Dead through Ken Kesey, during one of his infamous ‘acid test’ parties in 1965 and became friends with them. Owsley, or ‘Bear’, as he became known, began to work with the band as their sound man and financed them with his earnings cooking acid. He was also the person who along with his good friend Bob Thomas, helped design the iconic lightning bolt logo, which would sell countless t-shirts. After a hallucinatory incident, where Owsley ‘saw’ the Grateful Dead’s sound, he became obsessed with aural perfection and started on an endless path, working with the band, to achieve it. Keeping a sonic journal of each performance of the band, he would use it to improve on his setup and mix for each concert and highlight issues to the band members. He insisted on sound checks and encouraged them to listen to tapes of their performances, so that they could hear how they sounded, and also correct him on what he was doing. Rumored to have taken inspiration Buffalo Springfield’s monitoring setup, Owsley was not satisfied with the standard speakers and amplifiers that were available to him and began modifying and manufacturing his own audio gear with his apprentice Tim Scully, eventually founding the company Alembic. 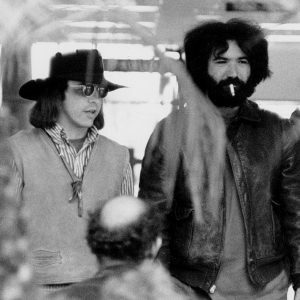 In a 1969 meeting when brainstorming ideas for musical exploration and solutions for their technical problems and smoking ‘special’ cigarettes, Owsley proposed putting the P.A behind the band. This casual, stoned suggestion would change the way audio engineers thought about concert sound. This meant that the audience and the band would hear the same thing without any delays, chaotic reverb, colliding frequencies, and minimal-to-no feedback. Soon after this, Bear began his most ambitious design to date. He, Dan Healy and Mark Raizene of the Grateful Dead’s sound team collaborated with Ron Wickersham, Rick Turner and John Curl of Alembic to create the legendary Wall of sound. The mammoth structure was massive, made up of over 600 hi-fidelity speakers that sat behind the band as they played. It used six separate sound systems which were able to isolate eleven separate channels with vocals, rhythm guitar, piano each having their own channel. Another channel each for the bass drum, snare, tom-toms, and cymbals. The bass was transmitted through a quadraphonic encoder, which took a signal from each string and projected it through its own set of speakers. The result of each speaker carrying only one instrument or voice at a time was crystal clear audio, free of intermodulation distortion. The Wall of Sound served as its own monitoring system and solved many, if not all of the technical problems that sound engineers faced at that time. This design was also the first of its kind to eliminate the need for a sound guy, at least at the front of house. In addition to monitor controls, each of the microphones had volume dials. The idea was that each band member could adjust the sound in real time. The situation of the monitors gave the band the power to control their own sound. While the system had many trials and errors, the largest version stood three stories high and about 30 meters wide, the first line array system of this scale ever assembled. High-quality audio could be heard at 200 meters, with decent sound up to another 200 meters, at which point wind started to degrade the audio. 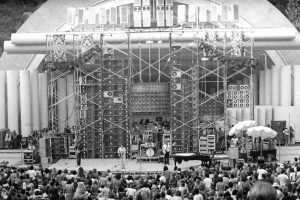 The completed Wall of Sound made its debut in 1974. Some of the early issues that surfaced was problems with feedback between the speakers and the singers’ rear-facing vocal microphones and the giant task of physically mounting the system. It was a logistical nightmare and almost made the band go bankrupt, because almost as soon as it rose the roof, it was time to pull it back down again. Eventually, the massive Wall of Sound had to be streamlined into a far more manageable and cost-effective touring rig. All the same, Owsley and the band’s willingness take ideas and execution to extreme lengths changed live sound forever. While parts of the wall were kept, repurposed and recycled for future touring rigs, other parts were sold off. Legend has it that friends of the Grateful Dead, Hot Tuna and Jefferson Starship quickly bought some of the highly sought-after top-of-the-range gear. While modern improvements in these technologies have the benefit of being far more powerful and lightweight than the Wall’s, in terms of experimental, unrestrained engineering, at a time where there was nothing like it ever heard, the Wall of Sound remains unparalleled.